The Polar Bears lost three players to graduation from a 29-win team, but are 3-0 after routing UNE, 106-55. BIDDEFORD — Abby Cavallaro drove and passed inside for Sadie Nelson’s layup, and the University of New England led 2-1. 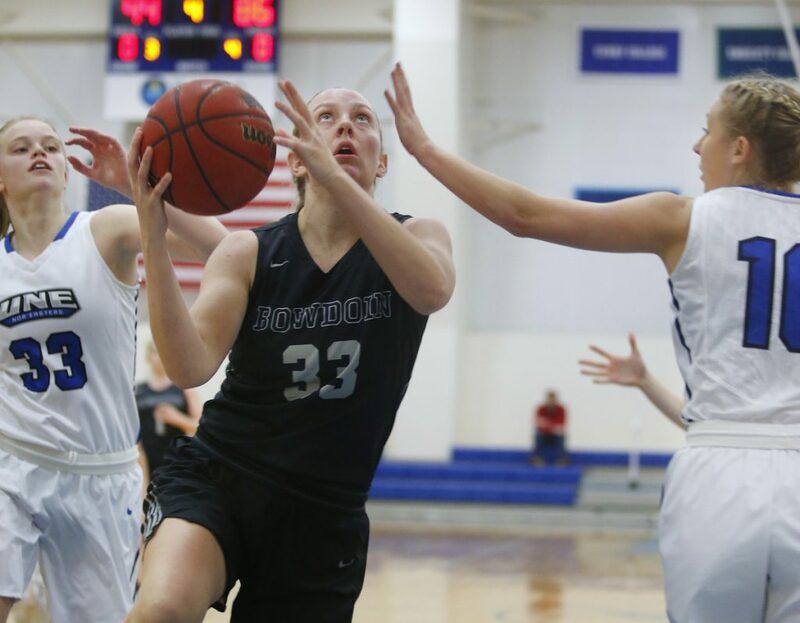 Then the Bowdoin College women’s basketball team did what the Polar Bears often do – they overwhelmed. Bowdoin hit shots and pressured on defense, taking a 12-2 lead, then 25-7 after the first quarter. Bowdoin looked like a team ranked No. 2 in the national Division III polls, romping past the Nor’easters 106-55 Tuesday night at the Alfond Forum. The Polar Bears (3-0) are still substituting freely, like they did last year when they brought home the second-place trophy from the NCAA tournament. 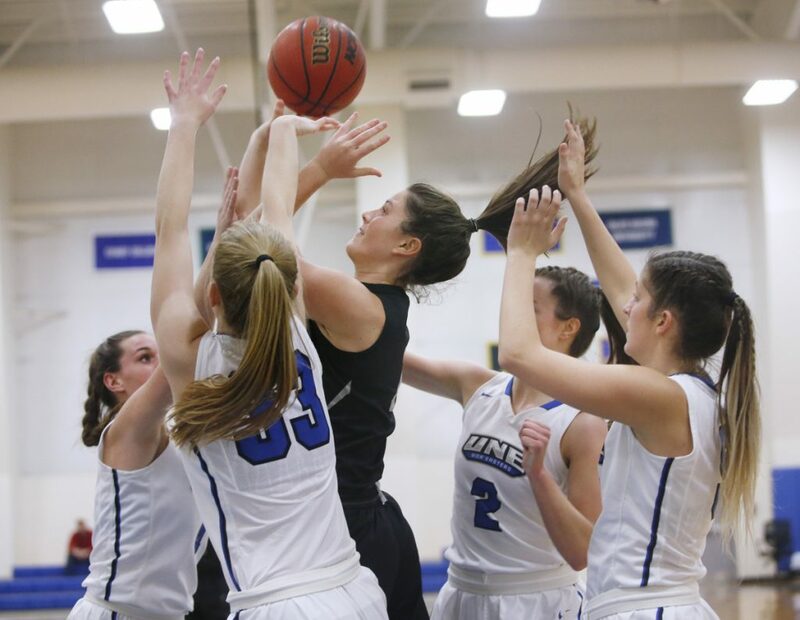 Bowdoin graduated three starters from that team – including conference player of the year Kate Kerrigan – and appear just as strong this season. “We knew we had shoes to fill. 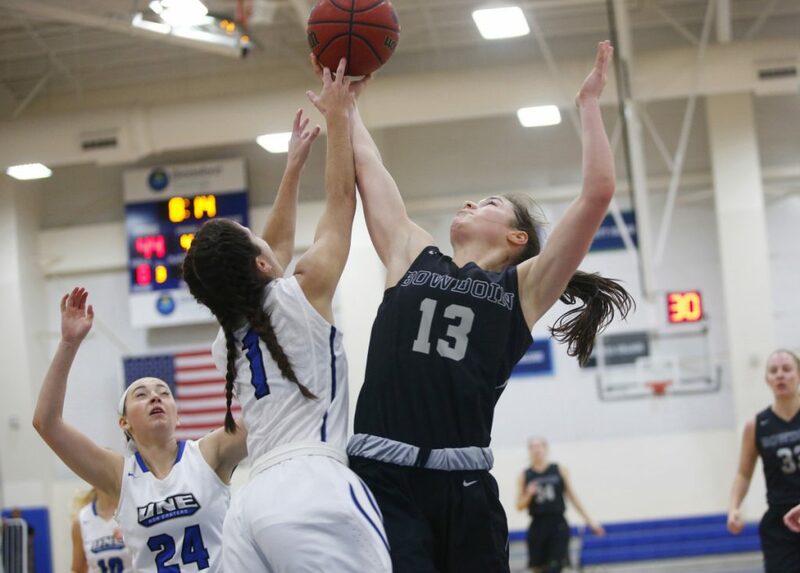 That kind of drove everyone to be a contributor this year,” said 5-foot-11 junior forward Maddie Hasson of South Portland. On Tuesday, Hasson (15 points) was one of six Polar Bears in double figures. Bowdoin came four points short of a 50-year-old team record for points in a game (110, vs. Thomas in 1978). This was no patsy that Bowdoin routed. UNE (2-3) has won six straight Commonwealth Coast Conference championships. 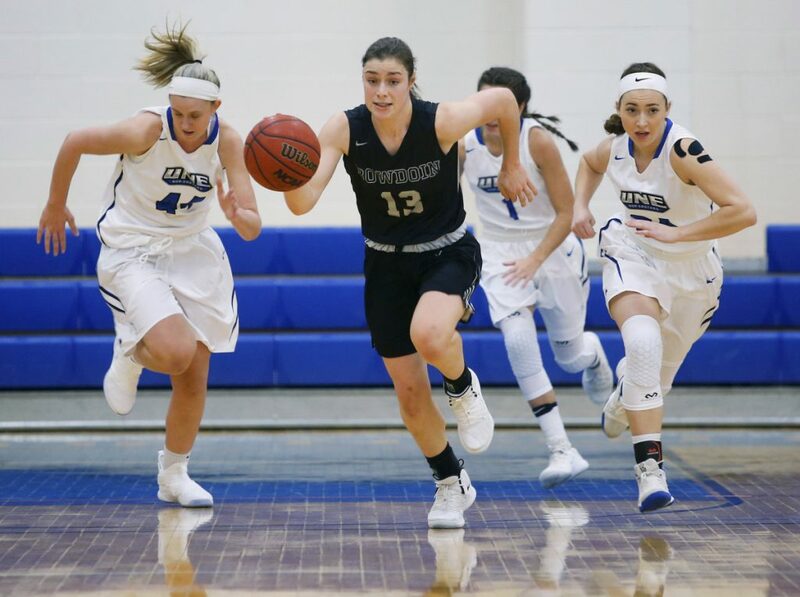 Nelson, a 5-10 junior guard from Windham, led UNE with 17 points. She’s one of the few Nor’easters with much experience. Bowdoin used all 14 players, the starters averaging 19 minutes. No matter the combination, the Polar Bears played together, shooting 60 percent, and totaling 32 assists on 38 field goals. “That’s awesome,” said senior guard Abby Kelly of Bombay, New York. 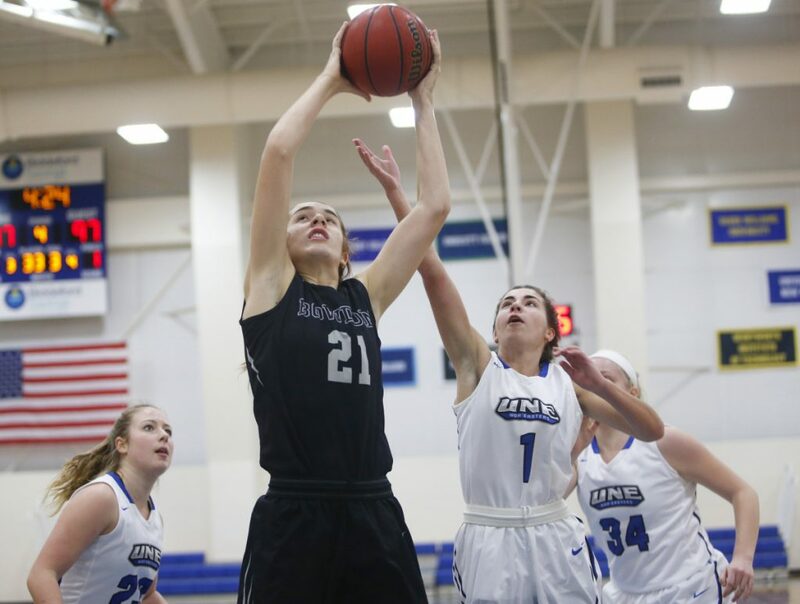 She led Bowdoin with 17 points. 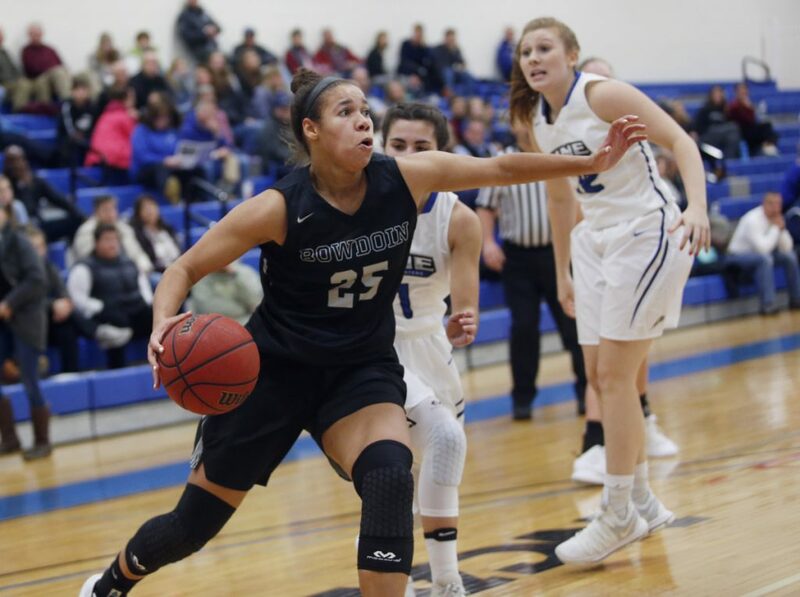 Senior guard Taylor Choate of Nashua, New Hampshire, had 10 points and nine assists in 21 minutes. Senior guard Hannah Graham (Presque Isle) and Moira Train (Cumberland) each scored 13. Senior center Cordelia Stewart (Bangor), the fourth Mainer on the team, added four points. Coach Adrienne Shibles likes to recruit from Maine, but her program has national appeal. Two of her four freshman come from California, including guard Sela Kay of Los Angeles, who scored 12 points. Kay was the first player off the bench and played 22 minutes. Bowdoin is winning games by an average of 51 points, allowing Shibles to send players in and out. Last year, Bowdoin finished 29-3. One loss came to Tufts, which Bowdoin beat twice (including an NCAA tournament win), and two losses came to unbeaten and two-time national champion Amherst, which defeated the Polar Bears 65-45 in the national title game. Amherst, Bowdoin and Tufts will again battle for New England Small Conference and national honors. Tufts, ranked No. 6, will play host to Bowdoin on Jan. 5. No. 1 Amherst comes to Brunswick on Jan. 26.